Late last year, grappling with the onset of dementia and headed into the studio to record a tribute to his father, Jack Cassidy, David invited a documentary film crew to chronicle the journey. During production David fell gravely and unexpectedly ill and it was during this time, he revealed to producers that his struggle with alcoholism had continued up through the recording session, and that his doctors had concluded that alcohol poisoning had likely been the chief cause of his tragic health decline, including his dementia. He would tragically pass away a few weeks later. 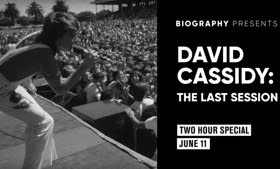 The two-hour, 'Biography' special David Cassidy: The Last Session will premiere on Monday, June 11 at 9PM ET/PT on A&E. "David Cassidy was one of the most beloved teen icons of his time, experiencing an unfathomable amount of fame at such a young age that few will ever truly understand and we are honored to let David tell his own story through his own words," said Elaine Frontain Bryant, Executive Vice President and Head of Programming, A&E Network. "Our newly relaunched Biography franchise is dedicated to bringing viewers the complete, inside narrative and that shines through during this very personal and humanizing documentary celebrating David's life, his amazing contributions to music and the brilliant legacy he left behind." In this documentary, a film crew sets out to document late actor and musician David Cassidy's publicly revealed struggle with dementia and follows him into the studio, where he works with his band to record new songs, including "Wish You Were Here," for a new album dedicated to his late entertainer father, Jack Cassidy. Over the course of production, David's health deteriorates dramatically. Interspersed with scenes from what will become, tragically and unexpectedly, his final session in the studio is the definitive tale of his explosive rise to fame, his conflicted relationship with his father and his own celebrity and the amazing legacy he left behind as revealed through exclusive, never-before-heard audio tapes from 1976, rare footage and stills and personal anecdotes he shares in the studio. For the first half of the 1970's David was one of the world's biggest rock stars, breaking venue attendance records internationally and reaching a level of fame that rivaled that of the The Beatles, The Rolling Stones and Elvis Presleyhimself. This profoundly revealing documentary explores that level of celebrity from the inside as few films have ever done. Interview participants include rocker and lifelong friend Alice Cooper; journalist and publicist Elliot Mintz; "The Partridge Family" stars Danny Bonaduce and Brian Forster; David's cousin Charles Douglas; Grammy Award-winning musician Kim Carnes; songwriter and musician Dave Ellingson; rock photographer Henry Diltz; Grammy Award-winning drummer Hal Blaine; "The Partridge Family" producer Mel Swope; former Tiger Beat magazine editor Ann Moses; former Rolling Stone writer Robin Green; David's childhood friend Sam Hyman; composer, producer and keyboardist Craig J. Snider; guitarist Dave Robicheau; drummer Teri Cote; bass player Frank Fabio and David's neuropsychologist Dr. Barbara Peavey.